THE GIRLS IN THE PICTURE. By Melanie Benjamin. Random House Audio. Read by Kimberly Farr. 16 ½ hours; 13 CDs. $50. Melanie Benjamin has made quite a successful career by spinning the real-life stories of famous people into entertaining novels. As she does so, she largely sticks to the known facts, but since life is messier than fiction, she takes liberties, leaving out some details and developments and adding others. Onto the basic framework of documentable history, she hangs imagined thoughts, emotions and conversations. In the past, she’s written about Charles Dodgson (aka Lewis Carroll) and Alice Liddell, the inspiration for Alice in Wonderland; Anne Morrow Lindbergh, the author and wife of the famous aviator; Mrs. Tom Thumb; and Truman Capote and the New York high society women he called his “swans” in the 1960s and ’70s. This latest novel is set during the birth of the movie industry in the United States, primarily as seen through the experiences of two friends, the golden-curled Mary Pickford, a darling of the silent film era, and Frances Marion, a journalist, author and highly successful screenwriter. The story Benjamin spins of those early days in what became Hollywood is fascinating and one the casual movie fan probably knows only vaguely. Mary Pickford and Frances Marion arrived on the scene in its early days, when movies were silent, brief and known as “flickers,” and respectable people in Los Angeles didn’t have much to do with the people who appeared in them – people they disparagingly called “movies.” The two lived through many developments in the industry and even spearheaded some of them. They were good friends, bound by their ambition and their determination to make it in a man’s world. We see them as young women, wondering if they will have to sacrifice happiness in their personal lives – never finding true love – as they pursue their pioneering careers. Then we see them decades later, when they are all but forgotten by the general public, and the vagaries of life have taken their toll on that friendship. The developments in the movie industry – technical, artistic and business – are intriguing and entertaining. Benjamin works the likes of Charlie Chaplin, Lillian Gish, Louis B. Mayer, D.W. Griffith and Rudolph Valentino into the story. When Pickford does find love and marries Douglas Fairbanks, the two become the King and Queen of Hollywood, greeted by adoring crowds wherever they go, in Europe as well as America. And then the “talkies” took over the industry in the late 1920s, and many silent screen stars, among them Fairbanks and Pickford, were unable to make the transition. She is a bit heavy-handed, however, in conveying her themes. We understand that Pickford, Marion and other women in the movie industry were often treated poorly by the men who held the power, and that they had to work twice as hard to get ahead. It’s jarring, however, to hear them think and speak in 21st-century feminist terms about their problems. And we understand, early in the story, that some of Pickford’s emotional problems stemmed from having to work at a tender age as a child actress, and from being made to feel that despite any success, she was always only a step or two away from poverty. Yet, Benjamin tells us this repeatedly. The narrative is also a little uneven, alternating between Marion’s lively first-person accounts and Pickford’s story, told in third person. And we get great detail about some things while others, such as Marion’s marriages other than to the cowboy film star Fred Thomson, are barely mentioned. Ultimately, though, the story is well worth the reading or listening. It’s both a fascinating look at the growth of the movie industry and a touching story about the friendship of two remarkable women. Kimberly Farr does a fine job of reading the audio version with just the right amount of expression and drama to bring the scenes to life in the listener’s mind – almost as if they were on the big screen. 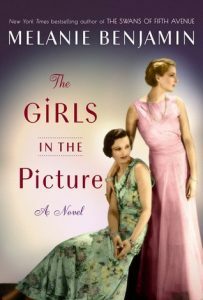 This entry was posted in Audio Books, Historical Fiction, Popular fiction and tagged Frances Marion, Mary Pickford, Melanie Benjamin, silent film era. Bookmark the permalink.